I recently found out that my neighbor of many years, Erland J. "Sonny" Schumann, reported to the BB48 in April 1941 and was present on board on 12/7/41. He does not have access to the internet, but I will pass all enquiries on to him. His battle station was a rammer in turret #4. He told me he was playing acey duecey in the bottom on that morning and went up several decks to go to the head. Sitting on the john he heard the first explosions, if he hadn't gone up to the head he would never had gotten out. Upon reaching the main deck he sprinted for the #4 turret, he dove under #4 turret to dodge a machine gun strafing that sprayed the deck where he had been running, knocking someone he calls Heidy under with him. After a few minutes in #4 turret they were sent to help get ammo for the anti aircraft guns. He said that he saw several men swim for shore, when they reached the burning oil their hair caught fire and they went under not coming back up. He said he was in the last lifeboat to leave the ship. He later spent most of the war on net tenders. 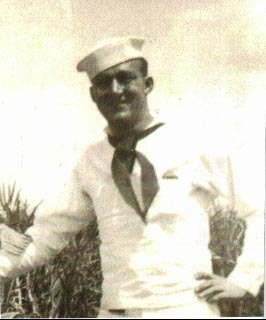 Erland Jack Schumann, Boatswain's mate 2/c, born April 2, 1922, South St. Paul, MN, graduated high school and joined the USN Jan, 17, 1941. He was stationed at Pearl AATC. He was also at New Guinea, Australia, Philippines, Borneo, Adak, Alaska and the coast of Morotai. Memorable experience was being on burial detail after Pearl Harbor; and later (after 1946) called back for Korea. Discharged Dec. 17, 1946, with the rank of boatswain's mate 2/c. He received the Pearl Harbor Medal, Philippine Liberation Medal, etc. His first wife passed away and he married Elaine Nov. 27, 1976. He has seven children, two step children, 13 grandchildren and two great-grandchildren. He worked as a welder at the University of Minnesota and for Swift and Co. He enjoys hunting, fishing, bowling and cribbage.